1) You probably want Affects Others extra on her Immunity if you want to use it to protect others. 2) I like the Second Picture. Xarathos wrote: First up: team leader. JoshuaDunlow wrote: Talk about a blast from the past. Ok now I can go into detail. First, it looks like you're missing an ability point in Presence. Normally I would just say that the abilities only cost 38 but when I look down at your skills I see that Presence is appearently supposed to be a 3 (based of Deception and Persuasion's modifiers) so I went with Presence is missing a point. Also, how far is "Throwing Distance" for her? If it's around 25 feet, instead of her Quirk, you could do Diminished Range x2. If it's farther then 25 feet though then the Quirk works fine as is. Other then that, it looks good and I must say this looks like a build I would love to play sometime. I think I will. Next time I get into a game where everyone is picking Marvel heroes like Wolverine or something I'll pick Boom Boom (assuming you don't mind of course). Murkglow wrote: Ok now I can go into detail. First of all, I'm glad you like her, and it's totally alright with me for you to use her in a game! Please, tell me about it here if you do - I'd love to know how she does. These builds need to get playtime! I thought the same thing about her when I was building her, actually - she has probably one of the most straightforward power sets I've worked with in ages, and yet it just looks so fun. . . especially between the two choices of trigger effects. You're right, Presence was supposed to be 3 - I'm not sure how I managed to miss that one. Fixed. Throwing Distance for her . . . I'm using the 2E standard in my head which is that throwing distance is about half as far as you could get with a standard (unaltered) blast power. "My robot brain needs beer." "We have beer in there?" Armored: Protection 11, Impervious 5 • 16 points. Titanium Alloy Construction: Immunity to Fortitude Effects • 30 points. Addiction: Beer. He's not actually chemically dependent on it, but he wants it. A lot. Reputation: Kind of a jerk. Distant:Aaron has trouble relating to the "fleshy ones." Prejudice: People are still scared of machines . . . for . . . some reason. Maybe the Sentinels had something to do with it. Motivation: Beer, probably. Acceptance, maybe. Showing up the fleshy ones? Priceless. Lech: "I analyze your every word, identifying subconscious speech patterns that betray your poorly hidden lust for my rock-hard robot body..."
Notes: If anyone has the "Swiss Army Knife" variable power, it's Aaron Stack. He's the closest thing I've ever seen to a Do Anything Robot. In Nextwave, he's also hilarious. He'll often use his variable trait for things like more ranks of senses, various bladed implements (strength based damage, or just damage . . . ), or his standard ranged attack, pistol rounds loaded into his fingers. Last edited by Xarathos on Wed Sep 15, 2010 11:43 pm, edited 3 times in total. Some minor corrections: You don't have his unarmed modifier listed int he skills section (it would be a +14). Also his defenses should cost 15pp not 13 (6 for Dodge and 9 for Will). My only other comment is I would recommend making his Regen 6 or 3. It's just easier to remember as with regen 6 you recover a damage condition every other round and with regen 3 he regens once every 5 turns. With Regen 4 you have an odd round rotation (something like 3, 6, and 9) which can be a bit of a pain to remember (since it restarts at 10, it is not every 3 rounds). Also I must say you're throwing these up quick. Did you have them made up in advance before you posted them or are you just so into the project that it's going easy? Actually for him Regen 4 is functionally Regen 3; the first point just unlocks healing ability for a creature without a Stamina score. Other than that, fixed the details, and thanks as always for the useful nitpicks. Xarathos wrote: Actually for him Regen 4 is functionally Regen 3; the first point just unlocks healing ability for a creature without a Stamina score. I know which is why I recommended 6 and 3 (which would be 5 or 2). Regen 3 (or in this case 4) means he regens on an off schedule. Say he regens on turns 3, 6, and 9. On turn 10 it "resets" and he regens again on turn 3 which means he has a 4 turn break in between the last regen and the first of the new "ten turn cycle". I know it seems like Regen 3 is easy (every 20 seconds) but since each turn is 6 seconds long you never "land" on 20 seconds so he has to "skip" at some point to make up that extra time he needs. It's a rather odd thing to keep track of but if it doesn't bother you then that's fine. Just felt I should point it out. Oh, duh. I don't know why I didn't put together what you meant, but I see it now. I dropped it to 3 - 5 rounds should work fine, and it's slightly cheaper - he isn't exactly Wolverine, after all. Sorry if I was making a mountain out of a mole hill there, I just got kinda wrapped up in my explainations. Also, I'm glad you're enjoying making these characters. It's nice to have a change of pace after a while and this is a pretty fun comic to build from. Hey, no worries - sorry it took me so long to figure it out, haha. Well, I'm pretty tired (it's after midnight here) so I'm gonna finish the rest of the builds tomorrow. These have to be my favorites so far, though, and you have to love any comic that has its own theme song. Flight: Flight 7 (250 MPH) • 14 points. Shouldn't she get a boost to this, to up to 671,000,000 mph, when in energy form? 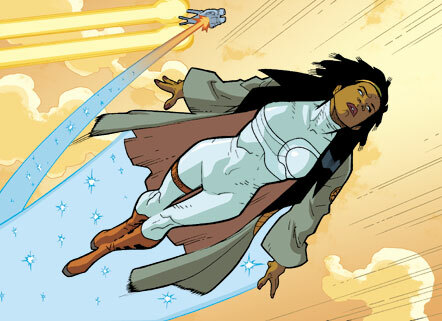 Honestly, that's a little far outside the scale of the chart for me to be messing with if I were to be perfectly literal about her ability to travel "lightspeed" - and she doesn't really do it in Nextwave. I'd probably put that down to some kind of application of Space Flight, personally, except that I don't know that she flies in space, either. But that would be a jump from Flight 7 to Flight . . . let's see . . . carry the 2 . . .
About Flight 27, give or take. With 20 ranks of it Limited (Only in Energy Form) for 20 points. Since she doesn't do it routinely (at least in Nextwave, the target point of the build), I'm more disposed either leaving it up to an elaborate power stunt using one of her other powers to boost flight (or even as an alternate power of her Energy Control - probably the cheapest and most balanced solution), or just adding a 2 point variation of Super-Movement for those who feel they need it. But we're talking about a comic in which she used a vehicle for most long-distance flying, presumably both because it could carry the whole team and possibly because it was faster for her at that stage in her career. Keep those Nextwave builds a'comin'.